One day you are playing great and the next day you are hitting the ball all over the place. So, how do golfers respond to having a bad round? Many of these golfers go the “figure things out” route. This can be a very slippery slope that digs them further into a rut. A few days later, you go to the driving range for some extra practice. You remind yourself to grip the driver more firmly and adjust your thumb position. You tell yourself to relax and make sure you complete your backstroke. You work on these aspects of your game over and over until the next tournament. You continue to over-analyze, overthink and over-work your technique but your play only worsens. Your swing feels jerky and out of control. It seems like there is absolutely nothing you can do to get back to your normal swing. Not only does overthinking and over-analyzing hurt performance, it can lead to an even greater problem… the yips! The yips are the ultimate manifestation of over-analyzing and overthinking. Golfers with the yips try to talk themselves through each swing. Golfers with the yips focus too much on the outcome. Golfers with the yips over-analyze the result of every shot. Golfers with the yips over control their technique prior to each shot. 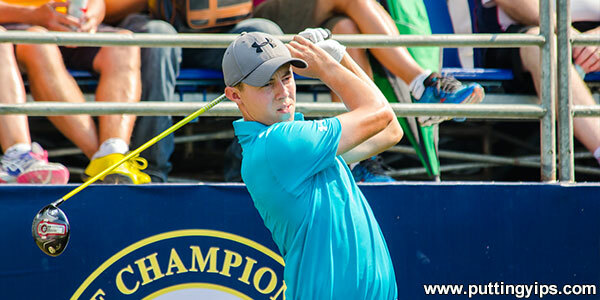 Spieth had a great start to his career with 11 PGA Tour victories by age 24, including wins in three Major Tournaments (2015 Masters Tournament, 2015 US Open and 2017 Open Championship). Spieth’s last victory was in July of 2017. In 2018, Spieth started the year ranked No. 2 and has since dropped 15 to No. 17. Spieth admitted that not only was his putting problematic, but also his thoughts exacerbated the issue. Renowned swing instructor, Hank Haney, sees the yips as the main cause for Spieth’s decline in performance. Getting back on track is more than working on your swing. If you want to regain your form, you must first attack it from the mental angle. That includes learning to trust your stroke, instead of over thinking how to swing the club. A bad round doesn’t need to send you into a performance slump. First, you must understand the underlying cause of your yips: FEAR. In most cases, the putting yips is all about fear of embarrassment. Next, you have to simplify your approach to putting and chipping. Less is better here. Go back to what’s worked and stop the over analysis or hyper focus on the stroke. You want to free up your stroke, not over control what you are doing. Trust your swing and your work, then get out of your own way… And PLAY! Overcome The Yips and Enjoy Golf Again! Anxiety, tension and over control of the stroke or swing? Inability to wing the club freely on the course, despite the fact that you can in practice? Instructors: Learn how to give your students the mental game edge. Coaches: Help your team members play with freedom instead of fear or tension. What are Golf Psychology Students Saying? Listen to a Chipping Yips Success Story. Download The Anti-Yips Practice Drills. 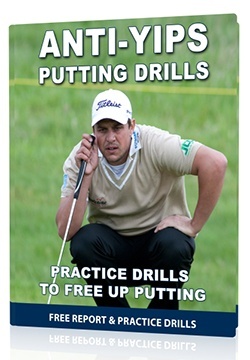 Read more Putting & Chipping Yips Articles. 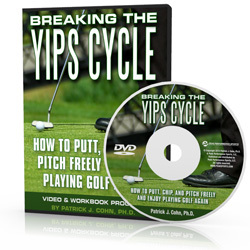 Learn about Breaking The Yips Cycle program. Read other Golf Psychology Articles. Click Here to Get Anti-Yips Report Now! Break The Yips Cycle Today! Can Golfers Control the Yips? Do You Focus on Making or Fear Missing? Should You Focus on Your Stroke When Putting? Does Your Putting Change on the Course?